For infant physical development, students learn about cephalocaudal and proximodistal development. Also share and discuss how infants track objects with their eyes in this clip and how visual stimulation helps head control. Students brainstorm little rhymes and songs that are frequently recited and sung to babies that promote both entertainment and imitation. Examples include “Where is Thumbkin” and “This Little Piggy”. Reiterate that babies imitate and are born to learn and learn by imitation. Since nursery rhymes encourage learning through repetition, the fingerplays will encourage students to use the model to create their own in order to promote physical development in infants. Students are provided a guide sheet that include instructions and rubric for the project and they are divided into groups of 3-4 students. They must create 2 fingerplays and upload them to Google Classroom. They were also given 3-50 minute classes to create their video. Some students gave permission for their videos to be uploaded to YouTube. Their examples can be seen here: Example #1 & Example #2 and Example #3. If students needed musical background for their fingerplay, they were encouraged to use royalty free selections from sources such as this. 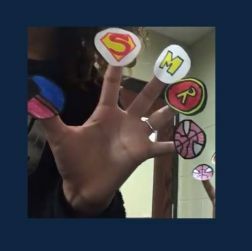 Students were also given the freedom to use any video software including iMovie or Spark Video to create their fingerplays. Fingerplay puppets or characters could be original in design or students could find pre-made versions online.